We still haven’t taken Little Bear backpacking, which I feel bad about. He’s proven to be a good sleeper, but still fusses and cries unpredictably and fairly often, especially during nighttime diaper changes. Frankly, I still can’t get it out of my head what a fantastic predator call his wailing is, and thus we’ve been sticking to dayhiking only. But that will change soon. The Moby wrap proved to be too slow to rig and way too hot for anything above freezing. The Vatanai is faster to use, comfortable, and secure, but the cotton fabric soaks up sweat and after a few hours on me gets a bit nasty (and is not sustainable for overnights). I made a copy of the Vatanai out of a thin, tightly woven and low stretch 100% rayon I found at Joanne’s (shown above), and while getting even shoulder pressure is tougher than with the thicker Vatanai, this seems like the way to go. 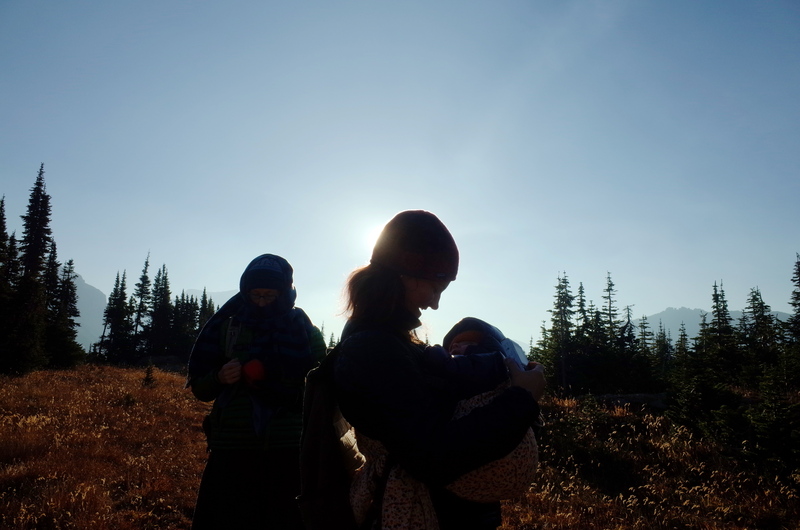 In either case, carrying a 14 pound infant on your front is a workout, and makes 12 mile dayhikes much more strenuous than than a pack 2-3 times as heavy. 12 miles is our longer outing yet, out and back to visit artifacts from LB’s namesake before the ranger station was locked for the winter. LB loves walking, and reliably falls asleep after 20 minutes. When he wakes up he enjoys cooing at the wind and play of shadows in the trees, and so long as he is bundled properly seems to prefer a good stiff 15+ mph breeze. Layering under the wrap took a bit of learning, and requires fast drying layers a bit on the light side, with pockets placed so he doesn’t have a zipper pull in his chin when he falls asleep against me. The XXL windshell I bought to go over both of use hasn’t been used too often, but is effective and was a good idea. As cute as his down jacket is, fleece is better for getting drooled on and is less slippery in the wrap and on a coat or pad when being changed. 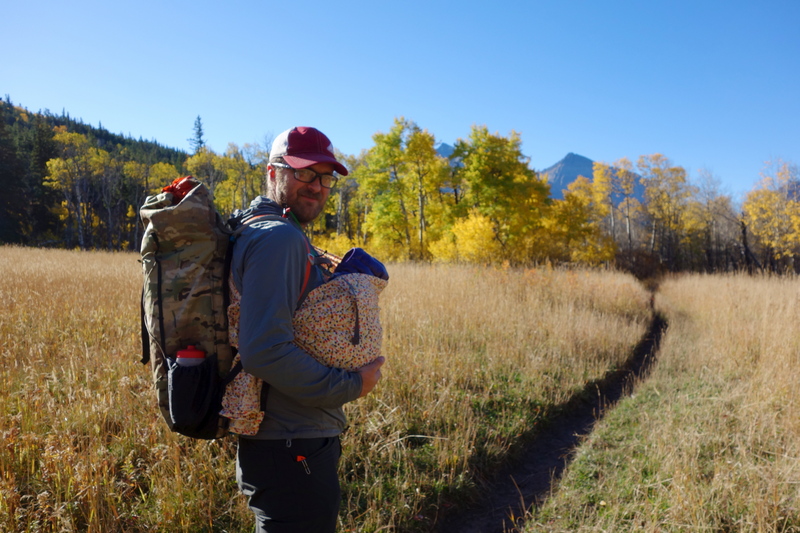 The Patagonia fleece bunting is fantastic for sleeping, with easy access for diapers. 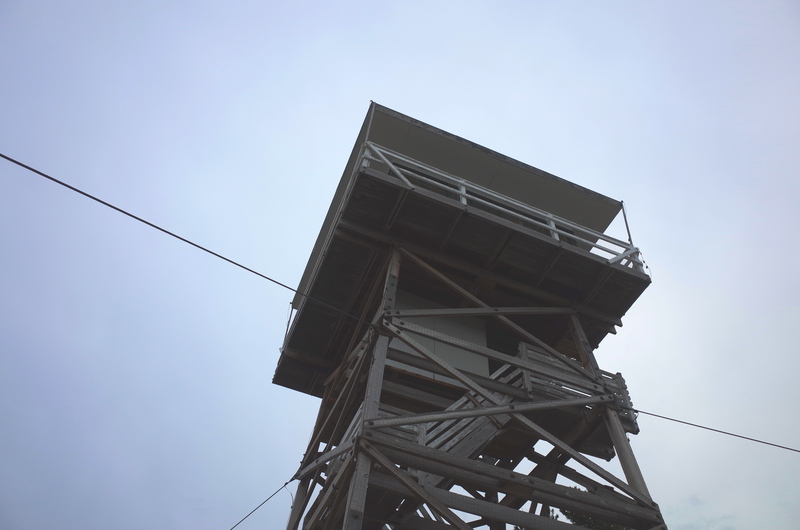 Lookout trips have been valuable tests for the real thing. The first time, back in early September, he slept very poorly. 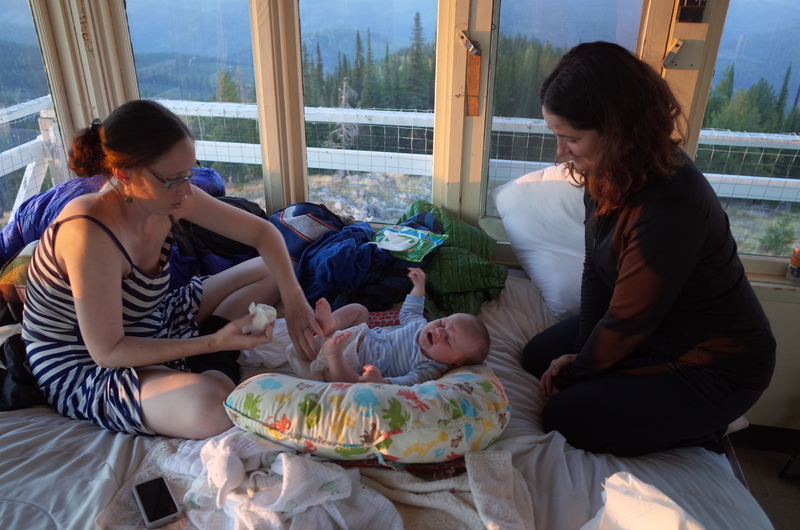 A few days ago in the Yaak, he slept just as well as he might at home, and even went back to sleep after a diaper change without feeding. 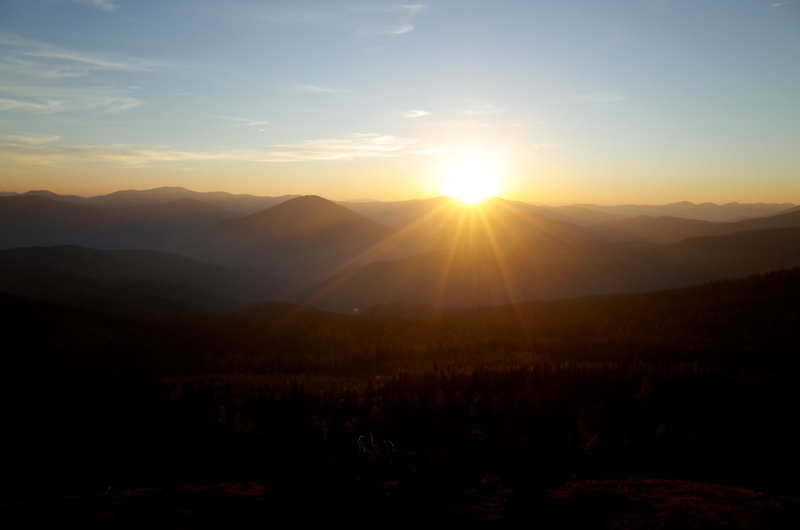 The most important practice is, naturally, for us. These outings are a lot more stressful not just because we have another living being to caretake, but because of the many added things we cannot well control. 40 minute feedings along the side of the road as evening grows alarmingly close are good for building patience and a detachment from particulars which I’ve largely avoided cultivating. Presumably it will come in very handy in a few more years. Such amazing organization, patience and love It warms my heart to see the three of you in the wild. It makes it a little easier to be so far away. My son is 13 months old and I’m seeing myself over the last year in these posts. 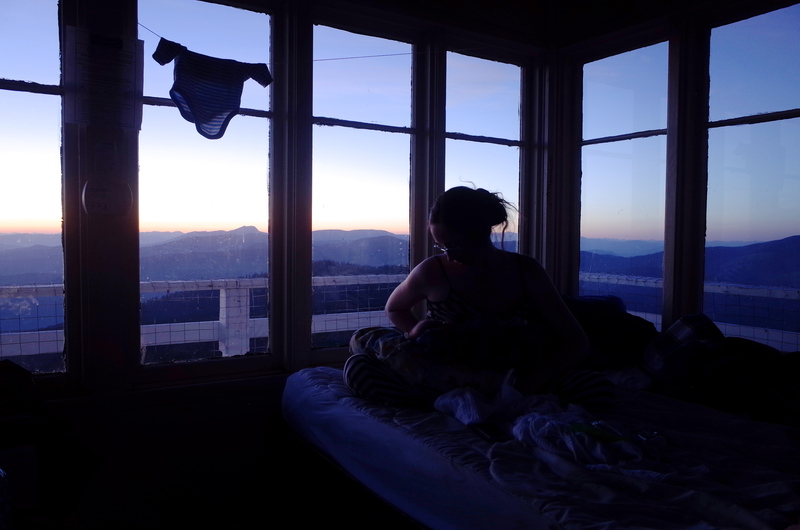 My husband and I were avid outdoor enthusiasts pre-baby, bushwhacking, hiking, backpacking…all the good stuff. Albeit, not in an awesome place like you are at with those predators. 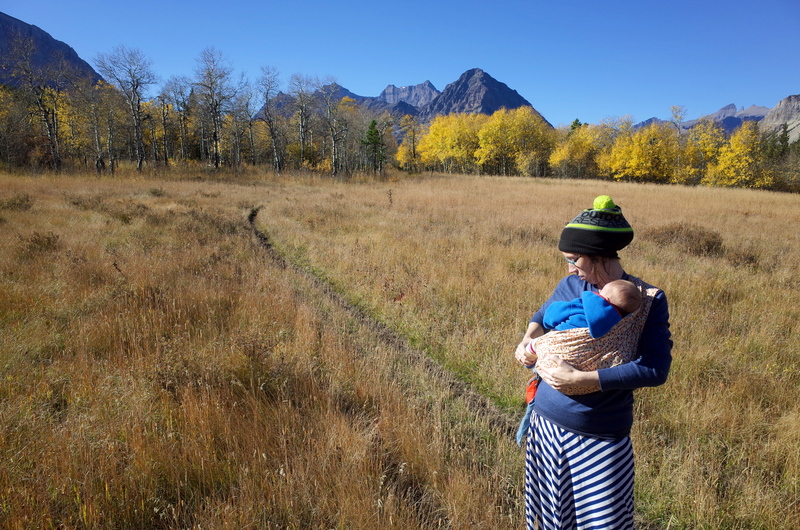 We did a few dayhikes when he was about 3 months old and I carried him in the front in an Ergo. 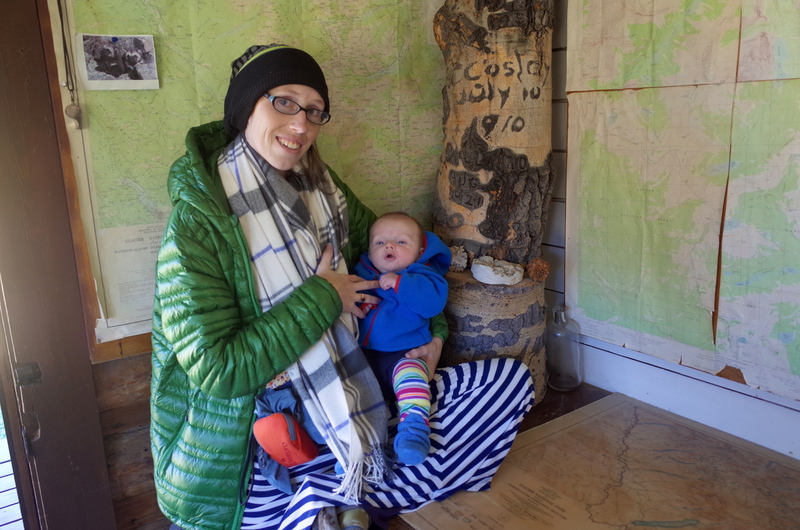 Then we did an 8 mile hike when he was 5 months also in an Ergo on the front and my back just about killed me. Switching him to my back finally made it a lot easier for dayhikes as the months went on! And hiking got even better when he was big enough for our Osprey Poco Pack! 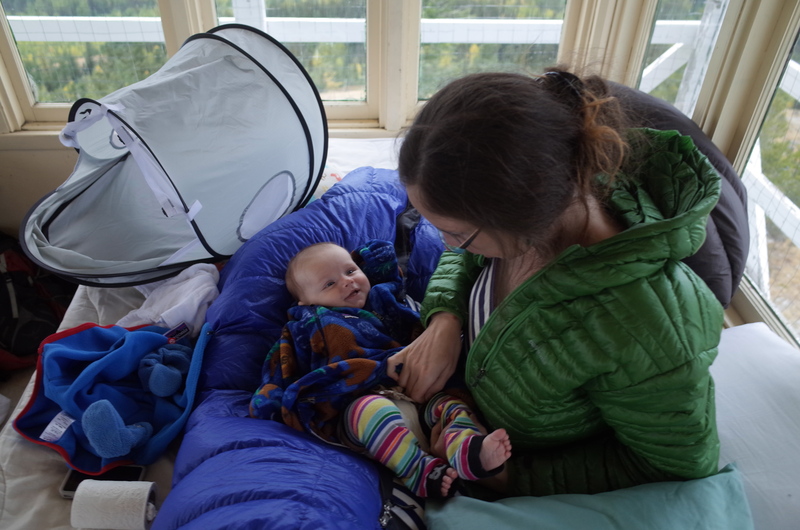 We still haven’t backpacked with him because a: he still nurses at night and b: no sleeping through the night yet…but that’s in our plans in the coming months. It is all definitely a lesson in patience. Definitely looking forward to him being backpack-able. Weight and head-holding are ahead of the curve thus far so that’s encouraging. Lots of ski-trailoring this winter.